(18228.11, Oklahoma Historical Society Photograph Collection, OHS). The Battle of Claremore Mound occurred in October 1817 when Western Cherokee and their allies attacked the lightly defended village of Chief Claremore (Gra-mo'n or Arrow Going Home), leader of the Arkansas Band of Osage. During the assault, many Osage died on an adjacent knoll where they had fled for safety. The hill, known as Claremore Mound, is located north of Sageeyah near the south bank of the Verdigris River in Rogers County. 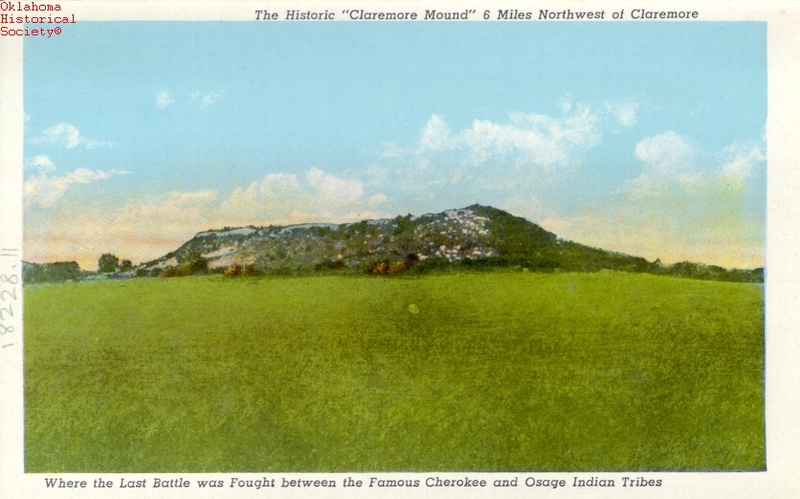 The bloodshed at Claremore Mound resulted from a long-standing struggle between the Osage and the Western Cherokee for control of present northeastern Oklahoma and northwestern Arkansas. The Arkansas Band of Osage (so called because of their proximity to the Arkansas River) had occupied Oklahoma's Three Forks area during the 1760s. Cherokee from east of the Mississippi began infiltrating the Arkansas River Valley soon thereafter. The Osage regarded the Cherokee as invaders. Osage efforts to defend their interests brought Cherokee retaliation, and vice versa. Approximately three thousand Cherokee resided in Arkansas by 1817, the same year in which the United States had guaranteed them land between the Arkansas and White rivers. Early in 1817 Western Cherokee leaders invited the Eastern Cherokee to participate in a war against the Osage. Joined by the Choctaw, Chickasaw, Delaware, and others, including whites, a fighting force of about seven hundred assembled at the Cherokee agency near present Russellville, Arkansas. The attack occurred when Chief Claremore and the majority of his people were hunting bison on the plains. Women, children, and elderly men occupied the village when it was attacked. Roughly eighty Osage were killed, including sixty-nine women and children. An additional one hundred were captured, and the village was burned. Only one attacker died, and several were wounded. Despite the establishment of Fort Smith in December 1817 and Fort Gibson in spring 1824, Osage-Cherokee hostilities continued. The Claremore band refused to comply with an 1825 treaty in which the Osage ceded their claims to northeastern Oklahoma. They continued to dwell near the Three Forks until 1839 when they removed to the Osage reservation in Kansas. Brad Agnew, Fort Gibson: Terminal on the Trail of Tears (Norman: University of Oklahoma Press, 1980). Grant Foreman, Indians and Pioneers: The Story of the American Southwest Before 1830 (New Haven, Conn.: Yale University Press, 1930). Willard H. Rollings, The Osage: An Ethnohistorical Study of Hegemony on the Prairie-Plains (Columbia: University of Missouri Press, 1992). Jon D. May, "Claremore Mound, Battle of," The Encyclopedia of Oklahoma History and Culture, https://www.okhistory.org/publications/enc/entry.php?entry=CL003.